A Perfect Kona Property: Sugar Sand Beach Waterfront, Western Exposure, and A Unique Lot in a Protected Bay! 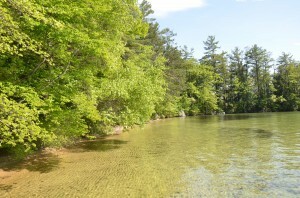 Kona Area Dream Parcel Seldom is available on the Winnipesaukee Market. This Kona area custom built home in a protected Kona bay has a magnificent sugar sand beach and gentle waterfront. 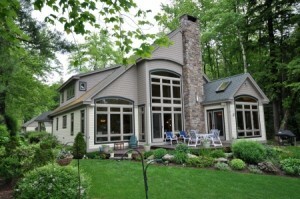 Nestled on a level lot at the end of a paved road with a long cobblestone lined driveway, this NH waterfront property has many unique features that have to be seen to be appreciated. The careful siting and adjacent woodlands of this finely detailed Craftsman Style home affords unusual privacy. A charming separate guest studio with its own garage, is also sited for privacy. A manicured lawn and gardens create a park like setting for both the main home and guest suite. The main home's angled front entry leads to an open concept floor plan that provides panoramic water views with beautiful sunsets.This 3 bedroom, 12 room home also has a 580 ft. nearly finished bonus room over the main house garage, which could be finished for additional square footage. One of the most desirable roads in Kona, Ruppert Road has beautifully kept homes and natural sugar sand waterfront. This listing abuts woodlands for added privacy! View the new video of 60 Ruppert Road, a Moultonborough NH Winnipesaukee waterfront, by visiting the listing details page and scrolling down until you see a frame of this new video. The main house has hardwood floors throughout and furniture finish natural woodwork. Red birch, random width floors have a warmth that combines the best of cherry and fir wood. A well-designed kitchen with walk in pantry adjoins an entertaining area with wet bar. The living room features a two story fireplace. A four season sun room compliments the master bedroom suite. The open concept dining room has a barrel ceiling and water views on 2 sides. A laundry room and office complete the first floor rooms. The large 2nd story loft has two separate areas for reading, office space, relaxing, watching television or just enjoying the lake views. A craft room, 2 en suite bedrooms and the large, nearly finished bonus room complete the upstairs rooms. Like the 1st floor, the 2nd floor has panoramic views and the sort of privacy that is reminiscent of being on an island. 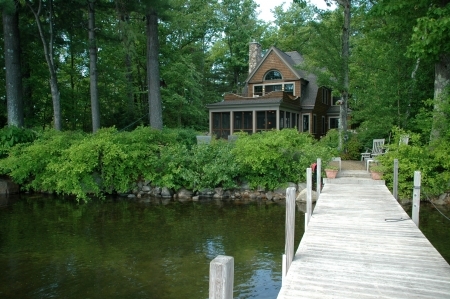 The architect and builder created a wonderful flow thought the home that takes into consideration the unique Winnipesaukee waterfront lot on which this property was sited. 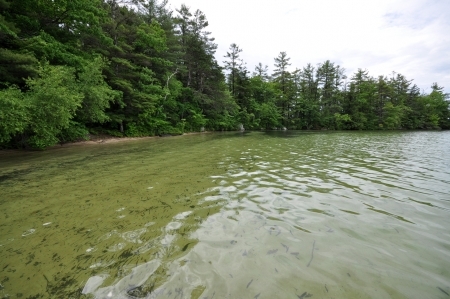 Waterfront amenities at 60 Ruppert Road, Moultonborough include a 50 dock and 2 moorings. Beautiful Bay Could Convert Everyone into avid Swimmers! Crystal clear waterfront! A Great Bay for Swimming! The beautiful bay has clear sandy water and a sugar sand bottom. The gentle waterfront is hard to resist and not only is it perfect for those who are not swimmers, but it may turn even reluctant swimmers into avid ones! Enjoy all day sun, or find the shade of beautiful old trees or the abutting woodland if desired. If you haven't experienced the Kona area yet, you owe it to yourself to experience this property first hand. 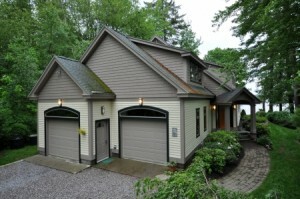 With the Kona location there is lots to do, not only in summer, but in Fall and winter as well, e. g., ice skating on the lake, cross country skiing and snowshoeing on trails off Jacobs/Colby road in the town forest, snowmobiling on trails off Moultonborough Neck Road, ice fishing, as well as skiing at your choice of many ski resorts within an hour and fifteen minutes from the Kona area of Moultonborough, NH. With Some of the Best Interest Rates in Years, Now May be the Time to Buy! Contact me for Information on Rates. 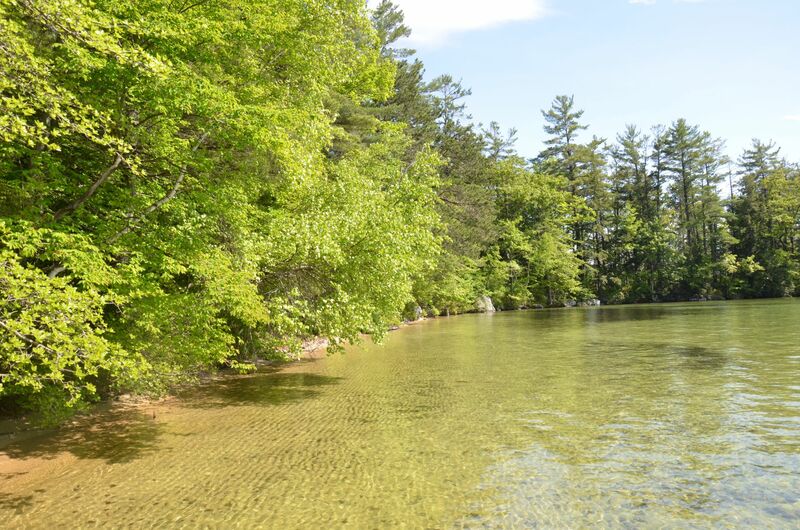 If you're curious about the Winnipesaukee real estate market, you may also want to visit all Winnipesaukee waterfront listings in Moultonborough or all owned Winnipesaukee or all shared Winnipesaukee real estate. Waterfront listings are available in many price ranges. With low interest rates, now may be the time to buy. St. Mary's Credit Union offers very low rates on jumbo loans with as little as 5% down to qualified buyers. Local banks such as Laconia Savings Bank and Meredith Village Savings Bank also have very competitive rates. Contact mefor details. Winnipesaukee real estate listing 60 Ruppert Road has an attached garage with top of the line windows that match the mission style windows of the home. The guest studio with radiant heat and 3/4 bath a its own attached garage as well.